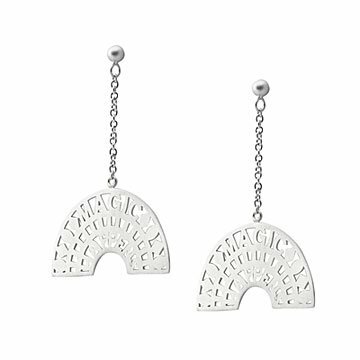 Manifest wonder all around you with the help of these sterling silver earrings. Look closely and you'll find magic in unexpected places—like, say, in a pair of dangly, sterling silver earrings. Puja Bhargava Kamath's message encouraging you to appreciate the small wonders in everyday life mixes in with a modern, graphic pattern. Wear them on days when you need a mood boost, or gift them to a friend who could use a little extra positivity. Handmade in India. Everything old is new again—and nobody knows it better than Puja Bhargava Kamath. Though she’s a graduate of India’s respected design institute, NIFT, New Delhi, she will always be a student of traditional craftsmanship and all the history that goes along with it. Her work as a designer for international jewelry houses led her to travel to remote parts of India, where she developed meaningful relationships with artisans and better understood their craft. This deep respect for age-old techniques combined with her own fresh design sensibility comes together to make a unique, pleasing aesthetic. She still spends three months each year in India, working alongside the artisans who help craft her designs. The rest of the year she "lives, works, and plays" in California. 1.5" L x 1" W Full Drop: 2.1"